Let us start by remembering the most important aspect of Agri-Commodities. They are not produced in a factory. Corn, today’s example, is produced by placing a seed in dirt with the proper amount of water and nutrients. Of that complete process nothing happens til the seed is planted. If no seeds are planted, no corn. All that happens only once a year. To plant those corn seeds the soil must have the proper amount of moisture and temperature level. Too much moisture, which is the situation in a good part of the Midwestern U.S. corn belt, prevents the tractors from planting the field. Further, too much moisture creates soil conditions in which the corn plant will not prosper. The soil must also be at a temperature that is conducive to the seed sprouting. When spring planting season arrives, the USDA’s weekly crop progress report becomes important reading. This week the USDA issued the second weekly report on the progress of corn planting. In the above chart the red line is the percentage of the corn acreage that has been planted thus far. In the latest report 5% of corn acreage has been planted. Black line is the historical average of corn acreage planting. On average 31% of corn acreage has been planted by the date of the latest report. While very early in the planting season, the current planting shortfall, actual versus average, is 84%. 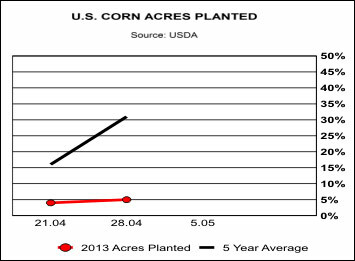 Bottom chart plots the corn planting shortfall, bars using left axis, versus U.S. corn prices, red line using right axis. Going into the first report expectations for the U.S. corn crop were very high. Farmers were expected to plant a record number of acres and per acre production was to recover to trend line levels. The first report did not change those expectations as the wet and cold conditions were widely known. The second report had an impact on prices as it raises questions about the size of the U.S. corn crop. Two reports, even as bad as these two, are not sufficient to overly worry about the U.S. corn crop. However, if the wet and cold conditions continue to impede planting of corn then expectations for the size of the U.S. crop will come down. Starting with 28 April report, each week with a significant shortfall probably should reduce expectations by about 1%. That might not sound like much, but the U.S. does not have much corn in the bins. Before the combines hit the corn fields in September, the U.S. will only have 21 days of corn consumption in the bins. As is apparent in the chart, corn prices rose on the latest report. Soybeans prices did likewise. Summer of 2013 has been our forecast for a major bottom in Agri-Grain prices. The problems that seem to be developing in planting the U.S. corn crop, while quite preliminary, support that view. Tier one Agri-Equities, pictured in the above chart, have been consolidating for about three months. That consolidation had developed in part due to the strong move of the Agri-Equities over the past year. Expectations of a massive U.S. corn crop also played a role in that consolidation. Should Agri-Grain prices begin to move higher due to planting issues, the Agri-Equities may move out of that consolidation prematurely. In any event, we expect the consolidation to end by late July. Investors should now be doing their research on Agri-Equities rather than waiting till they move higher. AgriMoney would be a good starting place for that effort.